Business model both in new designs and it management have become centre stage in many of our existing organizations’ thinking. The need is not just too simply find new growth through new business models but to ‘react and adapt’ those existing business model designs that are in place, to catch-all the emerging possibilities that are around, hopefully before others do. Are we doing a good job of this at present? Those without a legacy or are really agile usually are in pole position to explore new opportunities quickly. Also to start with a blank business canvas is exhilarating. It seems we are in the era of the Entrepreneur or are we? The entrepreneur has a great chance to pioneer, to quickly expand and seize those opportunities to disrupt those occupants serving a known market. The art of discovering the unmet needs of not just existing consumers but attracting in the ones presently outside the focus markets is such a valuable place to attack. Designing the new business model seems an awful lot easier than if you were involved within the’ poor old’ established organization locked into its structures, systems, existing markets positions battling with satisfying existing shareholders. Just moving those conflict points along within the organization often seems certainly from the outside, in perpetual conflict. There is a real challenge to see things differently and design differently! The established organization has to combat this increasing threat from all these “usurpers”. There is a strong call for change in existing organizations but there are often complex ecosystems to overcome and the demands for new structures and approaches to resolving these are increasing. It seems we are continually called upon to add more chief officers in innovation, in information, in knowledge, etc., etc. to address the constant gaps found within existing organizations inability to adapt, focus and design the business. Specialisation is needed but we seem to increasingly lack the function of pulling this all together. The Chief Executive seems to be so out on a limb defending, cajoling, managing and simply reacting to constant crises across their shortening tenure; we are losing the bigger picture perspective when it comes to designing the business to shape it towards the future. We need to manage the cross-cutting concerns in functionality, in constraints, in unlocking the resources successfully. Yes you could argue this is the role of the Chief Operating Officer but they seem far more focused on squeezing every bit of juice they can find from the existing operations. I hated it when the COO came knocking, you knew it was going to hurt. So who is this person then? This person, I call the Business Architect who designs and develops the business ecosystem. 3. Seek out and make sure the flow of business knowledge is occurring by applying a clear absorptive capabilities structure that sets about capturing, facilitating, accelerating and diffusing knowledge for it to flow throughout the organization and to its partners. 4. Possess the best business operational view or be part of the inner team to support operational structures that cut across functional and organizational boundaries. This includes working the boundaries to extend and push any key design parameters, such as open innovation, platform innovation, collaborative ventures that extend and build on the existing entity. 5. Have a clear view on the operation– perhaps not the responsible oversight but is able to capture, explain and link roles, capabilities and map these to the challenges being tackled today but designing those that need to be taken forward to build the future in more adaptive designs. These five aspects have been discussed in numerous Business Architecture papers before and are suggested to provide the integrated view of the organization. The absolute difference, for me, is not having these buried within the IT department but given the critical centre piece role of being the Chief Business Model Design Architect across the organization with an essential seat within the C-level team. They are responsible for the value configuration, building the necessary capabilities and focusing on the key activities and resources that are needed to implement change for different business models. They are a real change maker. So we need strong business model design architecture today. This person and his team design the business logic. It sets about to understand and describe the building blocks of business model design. It is the master of the Business model canvas, it understand the importance of the parts, their interlocking nature and can describe the rationale of how the organization creates, captures and delivers value for today’s business and is constantly exploring the future alternatives and having these designed into the future considerations. 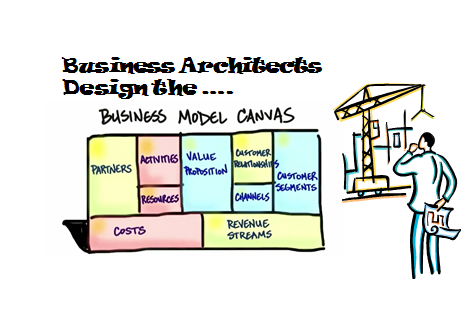 The Business Model Architect designs the different blueprints. They work out offering through all the means necessary the common understanding, facilitate the roadblocks and design constraints so as to align the strategic objectives with the demands placed on the design of the organization. They work the team, they cut across boundaries, they set about ‘creating’ the organizational framework and deliver the “how we do it”, they are the business design translators. They seek to design constantly what is needed, they look to instigate and demand changing capabilities to increase flexibility, to optimize and to adapt what is in place with what is needed to deliver the opportunities identified for giving new growth. They map, model and design. They make design more dynamic to adapt to change. Maybe they are tasked with offsetting the entrepreneur out there, presently determined to disrupt their business. It is time for exploring all the value points of being the ‘incumbent’ and it needs this holistic business architecture approach. They have and own the Architecture mandate for the organization for designing the architecture framework necessary for the business model and its design, not just for today but for the future. The challenge is to provide them with all the tools and immense ingenuity available to them if they can harness it correctly, which I believe they can. ‘Locked’ within the organization is plenty of latent energy wanting to find new ways of working, new designs, structures and processes. The design of new business models needs a clear focal point within established organizations. The very catalyst is that you need the Architect to orchestrate and completely manage this design process. This entry was posted in Molecules and tagged building better innovation tools, business design, business model canvas, business tools, design thinking, innovation business model, Innovation Competitive Advantage, jobs-to-be-done, revolution in innovation design. Bookmark the permalink. Thanks for this. I wholeheartedly agree with this and understand the challenges within a corporate environment. However, my focus, as a business and Innovation consultant for SMEs, is to use a sneak approach and get the owner managers or directors to review their business from the perspective of maximising efficiencies and changing to enable growth without referring to the word innovation. After a period, with my support of course, they start to develop an innovative culture within the staff and reap the benefits of this in their bottom line.